I’m using this onion “story” as an example, but these principles are applicable to anything you undertake. 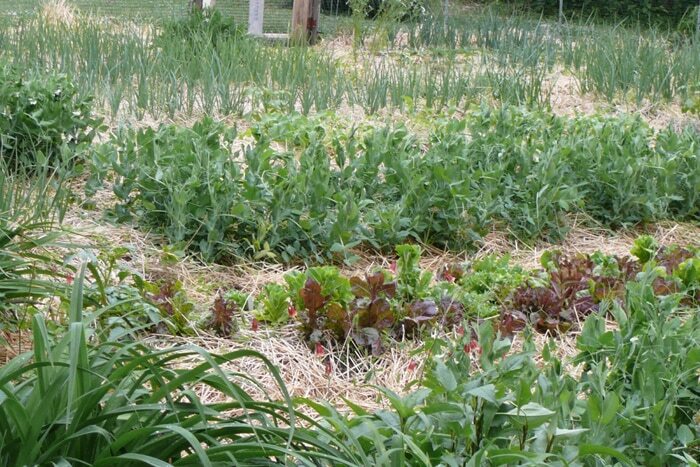 Four to six weeks BEFORE your last freeze date in the Spring is the general rule of thumb for planting onions. Although our average last spring freeze date is between April 1 and April 30th, most folks that I have known around here plant onions in April. I plant as early as February and into March. The keys to being able to go against what is usually done are knowing a bit about what you are doing and planning ahead ——–otherwise known to me as having a backup plan. Virginia winters are relatively mild. Severe cold doesn’t normally last more than a week at a time and then we usually have a week or more of sunny days in the high 30s or low 40s that are perfect for working out side. I take those opportunities to do whatever needs to be done outside so that if I run into trouble when its time to plant – that work is done. Last year I ordered the first of my onions to arrive in February. As it turns out, February was the most unseasonably cold winter month I remember experiencing here. When my onions came a 3 foot blanket of snow covered the garden. 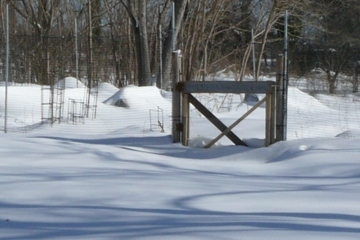 Garden and cold frames under snow in February. Fortunately, I had planned ahead. 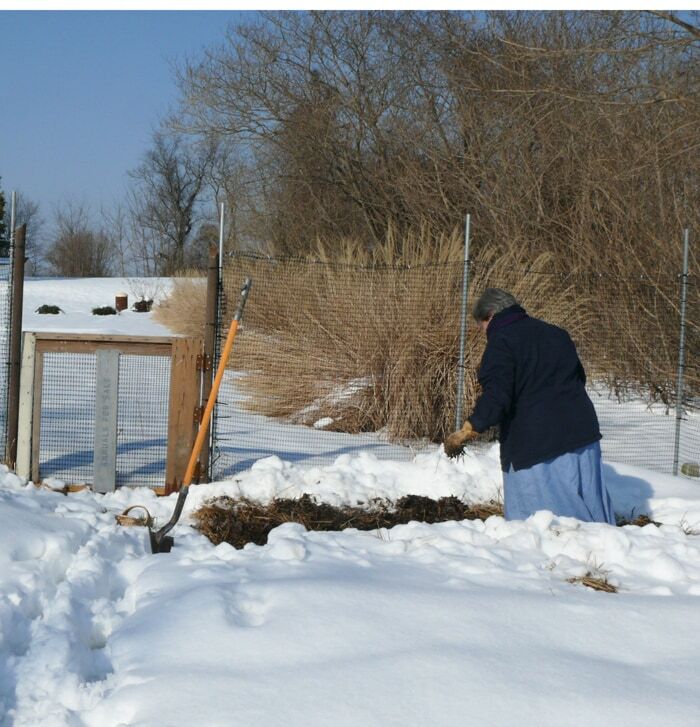 Under all that snow was an already prepared and mulched bed that I could easily identify. I shoveled the soft snow off the bed. Over the next few days I let the sun melt the little that remained. And then I planted. Snow removed from the prepared bed. In spite of the cold weather which when consistent can cause early bolting in onions, these first planted onions performed beautifully. As a matter fact, they were some of the biggest because they had longer to grow before the right amount of daylight triggered bulbing. Onions need plenty of time to grow BEFORE they start to bulb. Otherwise – you end up with tiny onions. 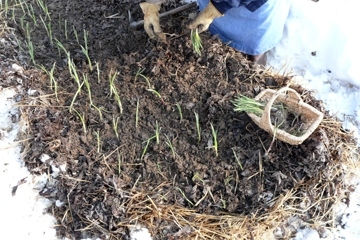 Because of more snow and severe temperatures, I had to wait 3 weeks before planting the other onions I had received. Because I never know for sure what the weather is going to be I always schedule two different shipping dates as a precaution. I don’t want them to have to wait any longer than necessary to be planted. 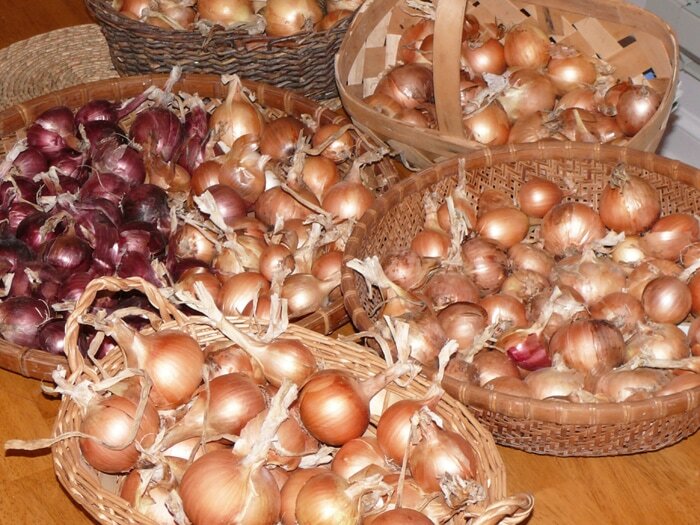 And by the time my second shipment of onions had arrived last year, the weather was cooperating. So all 1250 onions were in by the end of March. Rows of onions are towards the back and to the right. Ones planted in the snow are at the top half to almost the top right corner of this picture. Because of all that unusual-to-Virginia weather last year, I decided to check the Farmers Almanac. They had been right on target for December this year, so I decided to plan according to what they told me about the awful weather predicted for January and February. I ordered my onions to arrive at the end of February and again almost mid-March. Thinking optimistically, I need to order some onions to plant in February on some of those wonderful gift-days that are bright and sunny. After all March is suppose to be unseasonably warm and I’d like to have at least several hundred onions in the ground by then. It can mean the difference between mediocre results and your overwhelming success. Ooops! I forgot to order onions. Where do you get yours? Beppy, I get mine from Dixondale Farms. They sell transplants only. You can choose your ship date.